Blue Lily Commission - "Bharatadubs"
Blue Lily Commission is a Mooch side project Steve Palmer created in 2000 to explore Trance and ethnic music using computers and samples plus real instruments, including flutes, guitars, saz, lute, and what sounds like sitar. 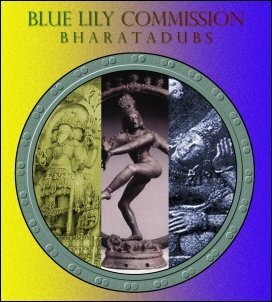 Bharatadubs is the sixth Blue Lily Commission album and has got to be the most cosmically mesmerizing music I've heard in some time. Karma sets the tone for the album with ethnic percussion as the foundation for this beautifully spaced out tune, punctuated by bells and held in place by a hypnotic sitar drone. Samsara continues with the same underlying sitar drone, plus chants and Ozric-like synths, but firmly in Steve's Blue Lily realm. I like the combination of dancey beats and multiple swirling electronic patterns that gently swayed my head as I floated along eyes closed under the headphones. My favorite part is shortly after the 8 minute mark when we get a groovy sitar solo paired with cool synth effects, part of which sound like a wildly spinning saucer. Brahmadub serves up the Dub groove the title implies, along with stringed instruments and loads of cosmic electronic melodies, soundscapes and effects. Shivadub is similar and includes gorgeous female Indian style vocals. And at 21 minutes Vishnudub is the longest track of the set. It's similar to the rest of the album but extends the journey, and I really love the keyboards which get very Pink Floyd/Eloy sounding at times. The only flaw in Bharatadubs is that it came to an end. Steve layers together multiple elements, both electronic, percussive and stringed, to create adventurously complex and psychedelically spellbinding music. Imagine a purely Trance, Ethnic, Chill-Out version of Ozric Tentacles and you might get something like Blue Lily Commission.